The history of Miera iela is proof of the legend that Riga will never be complete. 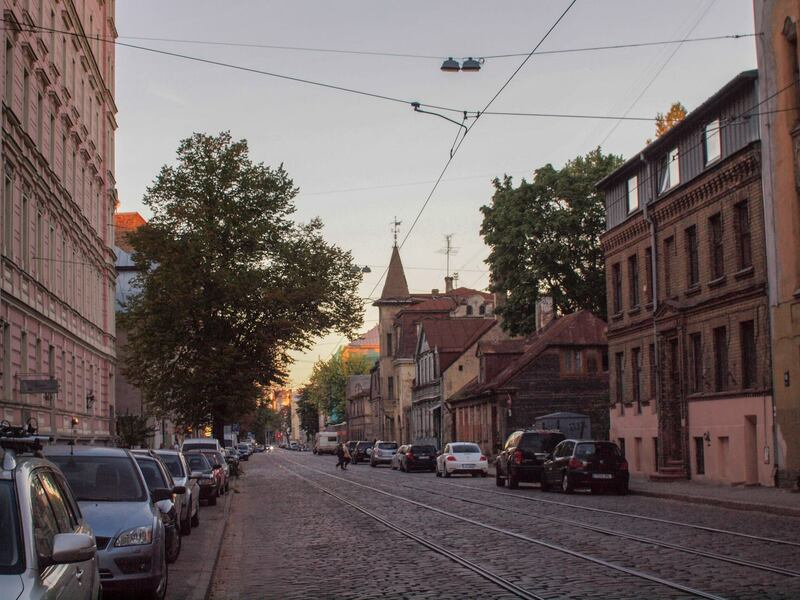 At one time, it was just a little path beyond the city limits which led to a graveyard, but as the years have passed it has grown into a dynamic, creative cobblestoned street, whose apparent peace is every now and then shattered by the legendary Number 11 tram. The motto of Miera iela – “the peace is deceptive” – truly suits this street, the centre of the world to Latvian hipsters. The meeting places for Riga’s intelligentsia are occasionally supplemented by new cafes and businesses with an alternative take on things. Concerts, lectures, improvisational theatre performances and exhibitions are constantly happening… Things here are always bubbling! Although the graveyard at the end of the street, nowadays more reminiscent of a kind of Gothic park, is the eternal home for uncountable numbers of Latvia’s intelligentsia, how that narrow little path became the important street it is now had more to do with the factories which rose up here, one after another, at the end of the 19th century. At that time, the people of Miera iela woke up in the morning to the smell of ground cocoa beans from the Laima chocolate factory, at lunchtime they breathed the fumes from the Maikapar tobacco factory, and every now and then the breeze would carry over the bittersweet smell from the nearby champagne factory on A. Briāna iela. Out of all the factories from that time, the only one still operating is the Laima chocolate factory, where the oldest Latvian chocolate-making traditions are preserved. Visitors are invited to find out more by visiting the Chocolate Museum (laima.lv). The champagne factory is now closed, but the space is now inhabited by hipsters and beer lovers. Fans of home-made beer can choose between Valmiermuižas alus vestniecība Rīgā (Valmiermuiža Beer’s Embassy in Riga) and Labietis – at each, one can try non-traditional Latvian-brewed beer; ingredients might include caraway, catnip, meadow-sweet, lingonberry and other types of herbs. Valmiermuiža’s restaurant will also be to the taste of those looking for a contemporary take on traditional Latvian cuisine. Riga’s creative types spend their weekday evenings and weekends at unforgettable parties at the legendary venues Piens, Nemiers and K.K. fon Sricka villa (9 A. Briāna iela), while tranquil evenings are passed in a relaxed mood with open-air concerts, as well as cinema in the cellar of the villa. For its part, the space of the former tobacco factory (58a Miera iela) is temporarily (until 2021) home to the New Riga Theatre of Alvis Hermanis, a Latvian director known throughout Europe. In the first decades of the 20th century, the street gradually became livelier, as representatives of the new intelligentsia took up residence in the just-constructed Art Nouveau and National Romantic tenements. These days, these flats are ever more in demand on the property market, and a number of these buildings now have their ground floors occupied by cafes or creative centres. In place of the swirling smells of cocoa and tobacco now waft the aromas of vegetarian food, vegan cakes, coffee and beer, not infrequently joined by equally alluring melodies. One of the most popular cafes in the district is the romantically decorated Mierā (9 Miera iela). On weekend mornings, you can find the tastiest waffles in Riga here, and every day its customers are spoilt with cakes, croissants and tarts. To enjoy live music, in genres ranging from indie to folk, to jazz and others, Riga’s culture vultures love to go along to Dad Cafe (17 Miera iela). This is a place where you can feed both your body and your soul. The cafe’s menu will meet the expectations of every hipster – there’s quiche, there’s vegetable chowder, there are healthy salads made from local products. The cafe is in a historic building, designed by one of the first ethnic Latvian architects of perpendicular Art Nouveau – Ādams Alksnis; later, it belonged to the family of the film director Ansis Epners. (Epners (1937-2003) was the award-winning director of a number of documentary films, including a film about the [Riga-born] world chess champion Mikhail Tal). The building is also connected with the family of the influential bookseller Jānis Rapa. This fact inspired the name of the bar currently on the corner, Walters & Grapa (Miera iela 19). This is also a favourite stopping place for those looking for beer and musical adventures. On Miera iela there are also a number of paradises for tea and coffee. The first is right next to Dad Cafe – Illuseum tea house (Miera iela 19), a shelter for those tired out by the hysteria of urban life. The narrow but cosy space is a place where you can escape from reality, stop time and lose yourself in hour-long conversations and tea ceremonies. Around twenty metres further on is Rocket Bean Roastery (Miera iela 29/3), a favourite among refined coffee-lovers. If you care about a coffee’s origin, the height at which the beans grow and other particularities, this is the place for you. The baristas there can give you at least five attributes for each coffee. The Scandinavian design, and the coffee-making process, which you can watch happening right there in the cafe, make this a place worth spending an afternoon coffee break. At the start of Miera iela, as if to show that the street is turning over a new page, can be found the idiosyncratic bookshop Mr. Page. This is not the place to go if you’re looking for something specific; it’s more for those who are open to the unknown and spontaneous. Trusting their own taste, these three Mierans have developed a singular collection from different publishing houses around the world, which they’re now offering to customers. The “republic” isn’t lacking in vintage shops either. One of them is ZeStore, where you can find ‘70s lounge chairs, ‘50s cocktail chairs and Scandinavian modernist furniture. At the classic-style interior design shop 20. gadsimts (20th Century), there are authentic Art Deco mirrors from France, Riga-produced dressing-table mirrors from 1956, lamps from the ‘50s and ‘70s, and so on. On the shelves are books which can tell you about 20th-century fashion, design and interior decoration. At M50 you can find real Mieran design, next to folklore-inspired contemporary clothing collections and accessories from Latvian designers, twice-recycled and nine times thought-over, as well as original clothes from every corner of the world. If you want to fit in among all the vintage furniture salons, you can be turned into a mademoiselle from the ‘30s or a ‘60s stage star by hiring a tasteful outfit from Uzvalks un Kleita (“Suit and Dress”). When you’ve chosen a dress, you can go to one of the republic’s hairdressers and get yourself a Mieran hairstyle – for example, a twirly moustache or sea-blue curls. One of the oldest Mierans is Melnais Knābis (“the Black Scissors”), a real favourite among society ladies. It was recently joined by creative hair workshop Augusts, popular with owners of adventurous hairstyles. It’s worth knowing that the proprietor, the jovial Dante, speaks English too. Art is discussed and enjoyed at the street’s cafes, but it’s also created right next door. On Miera iela is the workshop of glass artist Marta Ģibiete, as well as Ieva Grase’s ceramics workshop (39 Miera iela – in the basement). At Laimes Lade gallery, the art exhibited is also reproduced on a variety of everyday objects – such as cups, shopping bags, reflectors and postcards – creating unique gifts and souvenirs. At the art centre Trīs Krāsas (“Three Colours”), art arises from experiments, from delving into the creative process itself. When talking about the street’s tenement buildings, which popped up like mushrooms after rain at the start of the 20th century, each one prouder and more modern than the last, I have to mention Jānis Alksnis, the author of a number of them – for example, Number 10 (now the home of Cafe TAKA) and Number 17 (DaD Cafe). Contemporaries said that for many years afterwards Alksnis would go for a walk every morning to look at his houses and that he often took a turn along Miera iela. Also worth seeing is 27 Miera iela, a pearl of National Romanticism. Its designer was the renowned architect Eižens Laube. If the opportunity arises to slip into the building’s stairwell, it’s worth doing so. The author of Miera iela’s low-key, refined German Romantic-style buildings was Heinrich Devendruss. Especially noteworthy is the building situated at the end of the street, Number 94. The sharp towers on the roof of the six-storey building indicate that the republic ends here – over the train tracks rise the low wooden roofs of Čiekurkalns. Among the Alksnises and Devendrusses hides one more name of significance in the history of Riga – Augusts Folcs. At the top of the building at Miera’s junction with Hospitāļu iela (Hospitāļu 5), stands his sculptural composition “Blacksmiths”. A few steps further, opposite the Great Graveyard (Lielie Kapi) is where, historically, the noisiest and quietest parts of the street met – here, in earlier times there were a whole line of stone-cutters’ workshops, one of which was Folcs’s. One of his neighbours was the Lača (Bear) workshop – where, incidentally, the details for Latvia’s Freedom Monument were worked out, under the management of Kārlis Zāle. Although it’s in a neglected condition, the Great Graveyard is just as significant and worth seeing as Montparnasse Cemetery in Paris. The tradition of burying here started in the last decade of the 18th century, and here you can find many different historical figures and architectural monuments. The graves of certain people have become cult sites and are regularly visited, such as those of the clairvoyant Eižens Finks and the actress Vija Artmane, both buried in the Pokrovs Cemetery. At the far end of the Great Graveyard, there are memorials to Andrejs Pumpurs, the author of Latvia’s national epic, Lāčplēsis; Krišjānis Valdemārs, a social and political activist, and journalist; Fricis Brīvzemnieks, a poet and journalist; and Krišjānis Barons, a collector of Latvian folk songs. Agita Salmiņa is a freelance journalist and tour guide, who is interested in the development of cities’ history, culture and art. Riga has been her home for seven years.